The world of underground hip-hop is now at the forefront of today's music scene. Thanks to Flatbush Zombies & Joey Bada$$. They're now causing huge waves of excitement as they're cruising from coast to coast for their much-awaited concert tour. 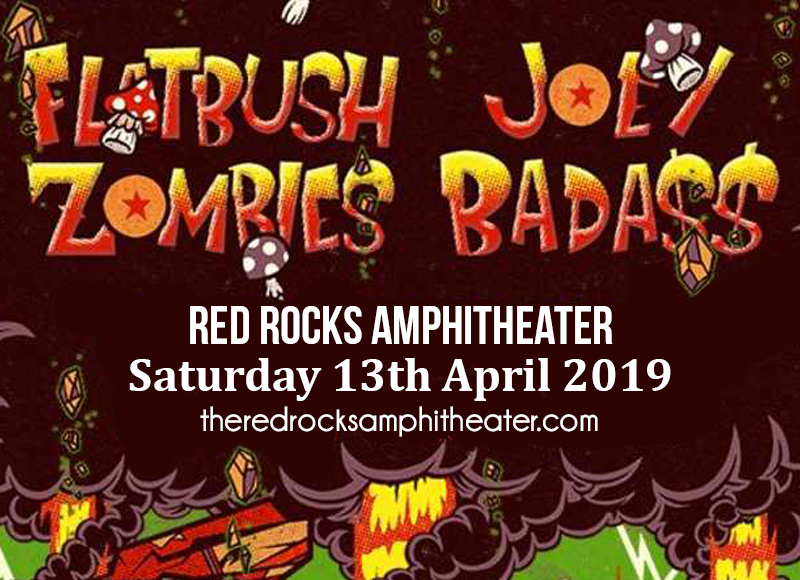 Flatbush Zombies & Joey Bada$$ are all geared to shake it up and break it down at the Red Rocks Amphitheater on Saturday 13th April 2019. Be there at hip-hop's finest hour by locking-in tickets to the show. Legions of their followers are definitely on the prowl for tickets, and if you're not quick enough, chances are, you'll end up with regrets. Don't skip on this knockout show. Hurry and click 'buy tickets' now! Amazing talents lurking in the underground are not meant to stay in the dark forever. One day, lights from a computer screen or a mobile phone will flash upon them and bring them out in the open for all the world to witness and marvel at. Such is how it happened for Flatbush Zombies & Joey Bada$$. Joey Bada$$ 's career has its roots in the freestyling video he uploaded on YouTube. It reached the eyes and ears of World Star Hip Hop website and turned the heads of music execs who wasted no time giving him a record deal. His passion for hip-hop started in high school. He co-founded the hip hop collective Progressive Era, or Pro Era which gathered and supported self-supported start-ups like himself. His debut solo mixtape, titled 1999 was released in 2012. From there, the ball started rolling for his career loaded with superstar-level collaborations which include Kiesza, Mac Miller, Action Bronson, ASAP Rocky, Kendrick Lamar, Fall Out Boy, and Smoke DZA; as well as an ammunition of hits such as "Waves" "Unorthodox," "My Yout," "Big Dusty," "Curry and Chicken," "On and On," and "Teach Me." Flatbush Zombies are a trio from Brooklyn, New York. Rappers Meechy Darko, Zombie Juice and Erick "Arc" Elliott got together for the common love of hip-hop music. They were part of Joey Bada$$' Beast Coast movement of experimental hip-hop. The release of their “Thug Waffle” video reaching 2 million views and counting, started brewing a cult following. Their first mixtape “D.R.U.G.S” (an acronym for “Death and Reincarnation Under God's Supervision”) set the wheels in motion that they mean business. The release of their second mixtape “BetteroffDEAD”, led to significant collabs with Danny Brown and Action Bronson, RZA, ASAP Rocky and Juicy J. They impressed critics, earned the respect of other hip-hop artists, and more importantly, gave fans their super dope, head-bobbing hits: "Bath Salts," "Bounce It," "This Is It," "Just Blowin' in the Wind," "New Brooklyn," "Tomorrow's Gone," "Mood Swings," "No Religion," "TLC," "Modern Mayhem," and "Bring Em Out." Two hip-hop heads are definitely better than one. Get ready to rumble because Flatbush Zombies & Joey Bada$$ are gonna slay it!